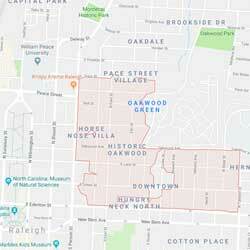 Oakwood is located north of downtown Raleigh, NC and was developed between 1880 and 1930. The neighborhood is made up of a variety of architectural styles including Victorian, Craftsman and Minimal Traditional. Oakwood is listed as a historic district in the National Register of Historic Places. As part of this designation, all changes to the exterior of the homes are subject to review by Raleigh Historic District Commission. Oakwood received its name from the incredible oak trees that line the streets. Square Footage ranges from 1,000-3,500sq ft.